You will love: The gorgeous cut outs and tall structure that make it a WOW toy! One look at the Monster High Deadluxe High School playset and you can appreciate the structure and tiny details. This toy will make you miss your Barbie house days! Note that these can take a bit to set up, so if this one is a Christmas gift, pre-set it up for a morning of fun over frustration. Monster High Fan will love: The endless amount of rooms that make them excited to bring the girls where they are at in the shows. Plus we all know the little ones love dreaming of high school days, so it’ an extra delight. In the creepy cool hallways of Monster High, adventure lurks between classrooms and secrets hide in the walls! Explore the mystery with this uhh-mazing play set that captures the iconic school with monster-scale. Designed to be extra-large, it holds more monster surprises than ever before! Open to expose multiple levels and rooms for play or display. Enter through the storied doors and into the main hallway that doubles as an event space with accessories to get a party started. Looking down from the second floor, reached by climbing the treacherous steps, the radio station, with its radio booth and signage, can keep the party going. Be nice to the tentacles that emerge from the locker because they create a seat, or head up a second staircase to get to the bathroom, equipped with a sink and mirror. In the second wing, ghouls can soak up ancient knowledge in the Library/Study Howl (with secret passage), grab a bite in the Creepateria or hang upside-down in the Vampire Lounge — snap a doll into the gore-geous pink and black quilted chair — to hang it from the ceiling or clip in the doll’s feet directly for the ultimate vampire experience! dolls not included. You will love: This playset which is a perfect add on to any large Monster High playset or even a quick stand alone for friend or travel play, comes with a gorgeous doll that allows for a super smart parent present purchase. Plus at 30% off, this toy is well within a normal Christmas cost levels. Monster High Fan will love: With an iPad dock up, you can bring on the Monster Mash for some musical fun! Monster High 13 Wishes Room Party and Doll: Howleen Wolf discovers a genie lamp and turns Monster High upside down Monster madness ensues, particularly when poor Lagoona Blue is turned into a freshwater sea monster But along the way, the ghouls make two new friends and possible BFFs (beast friends forever, of course) The 13 Wishes Room party is a great place for them all to fang out. It’s one of Spectra Vondergeist doll’s favorite places – she loves to haunt the room listening for ghostly gossip and she looks absolutely boo-tiful doing it When it’s time to monster mash, girls dock their iPod and electrify the entertainment Includes doll, the accessory/iPod dock and a themed piece-count. You will love: Bring in your smallest Monster High fan with this easy to click and play Mega Bloks set. You will love that this set can be easily built and enjoyed by kids of all ages. Get Free shipping here. Monster High Fan will love: How easily this Mega Bloks set brings some Monster High action in their other toy Mega Bloks sets! 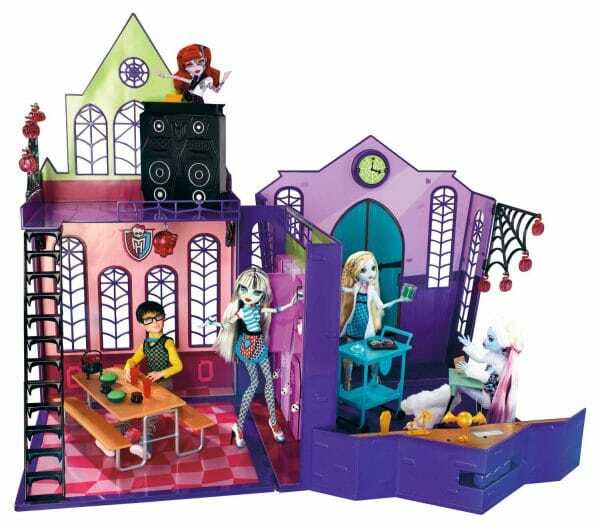 This graveyard set also plays 3 Monster Hit Monster High songs. It’s a scream at the Graveyard Garden Party by Mega Bloks Monster High and everyone is dying to get in! Build the graveyard, where party VIPs Cleo de Nile and Lagoona Blue are getting ready for the social event of the year. Open the cemetery gates to reveal a killer dance floor with real party lights, tombstones that transform into speakers and a DJ Booth where you can request your favorite tune. Press a button to play three real Monster High songs and make sure to keep the music going so the party never dies! Ideal for ages 6 and up. You will love: This is last years fantastic play set from Monster High. This is one big huge set reminding you of every morning you woke up on Christmas and wanted to know that Santa had been there. Want a wow gift? This is definitely it for your Monster High fantatic. Monster High Fan will love: The adorable up and down elevator action, the hidden corridor and all the great furniture that can be moved around. Frankie Stein has lost her spark! But her beast friends forever are rallying to give her a helping claw and get her recharged. 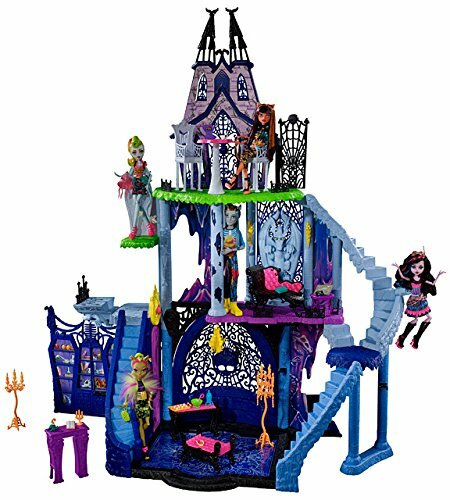 Much of the action happens far below the howlways of Monster High in the creepy cool catacombs – recreated with this play set. 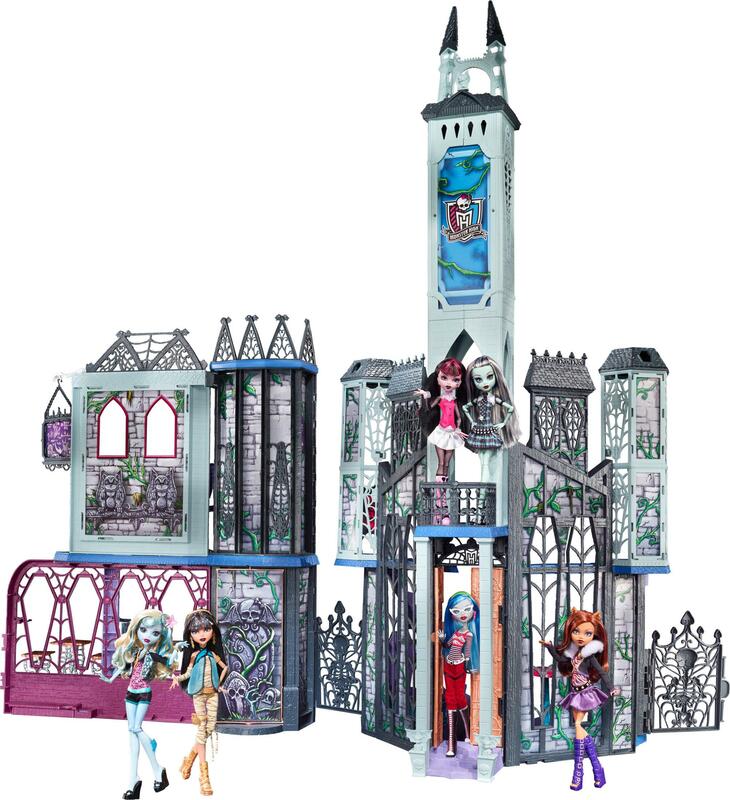 Three stories high and featuring multiple places for ghouls to fang out, the Monster High Freaky Fusion Catacombs set has all kinds of uhhmazing options for play and display – plus some scary cool secrets as well! You will love: That this set is an easy set up with under 20 minutes! Parents also love that Monster High encourages so much interesting school play and with a science classroom and outdoor fun, you are showing your kids all the great things about education. Monster High Fan will love: How closed up it looks like a coffin and can be easily transferred from one room of the house to the other or even to a friends for playtime. Monster High High School Playset: The hallways of Monster High are now alive with the ultimate accessory that looks just like the infamous school! This fold-up set opens to reveal six play areas. There’s the school entrance, where the cool ghouls gather. Say hello to the gargoyles that greet visitors to this iconic building as you swing the knockers and enter through the tall, double doors. Take class in the Mad Science Class Room, with two student desks, a lab cart and a blackboard with lesson. Creep through the iconic locker hallway; grab some school supplies from the lockers that really open and have working locks. “Fang” out at the table in the Creepateria, a scary cool spot for lunch or school events. Exclusive Bonus toy: Check out this new Monster High Create a Monster Head and Iris Clops here! « Native American Paper Craft: Practice Shapes!